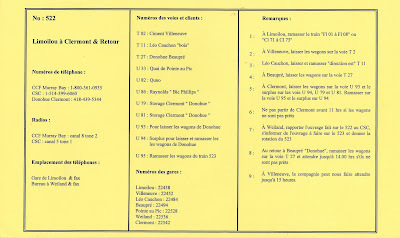 A few years ago, Jean-François Dumont – a well-known railfan and photograph in Quebec City area – sent me a scan of a Chemin de fer Charlevoix (CFC) timetable issued in 1994. 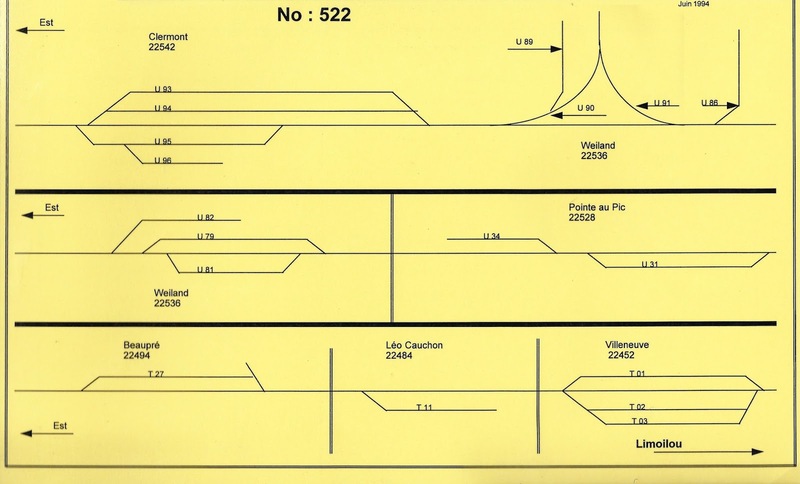 While it was of little interest to me back then except for the track diagram, I revisited the document during the weekend only to find information of great interest to operate our layout. Sure, all this didn’t start from nowhere. Jérôme and I have been discussing a lot the Charlevoix aspect of the layout. While our Montmorency scene is promising, we must admit it makes very little sense in term of geography. It is also of little interest when operating. Truth to be told, switching cars hidden behind a tall structure isn’t very practical in the long run. May look neat on paper, but the gimmick can get old rather quickly. Also, we can’t overlook the fact Dominion Textile was no longer in business after 1985 and was a smoking pile of burnt rubbles by 1994. How much you can stretch reality until it feels phony? Personally, I’ve never been a fan of such anachronistic collages. That said, Jérôme asked me if I could evaluate a few ideas about dedicating Montmorency to a 100% Charlevoix narrative or something else. 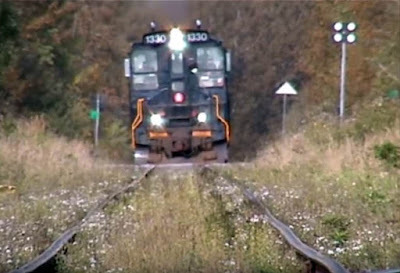 Not easy should I say and not a new idea… As regular readers know, the original concept called for a nice long stretch of tracks along the St. Lawrence River. This would make for a neat scene. However, the layout has been operated over 2 years now and things start to become clear. 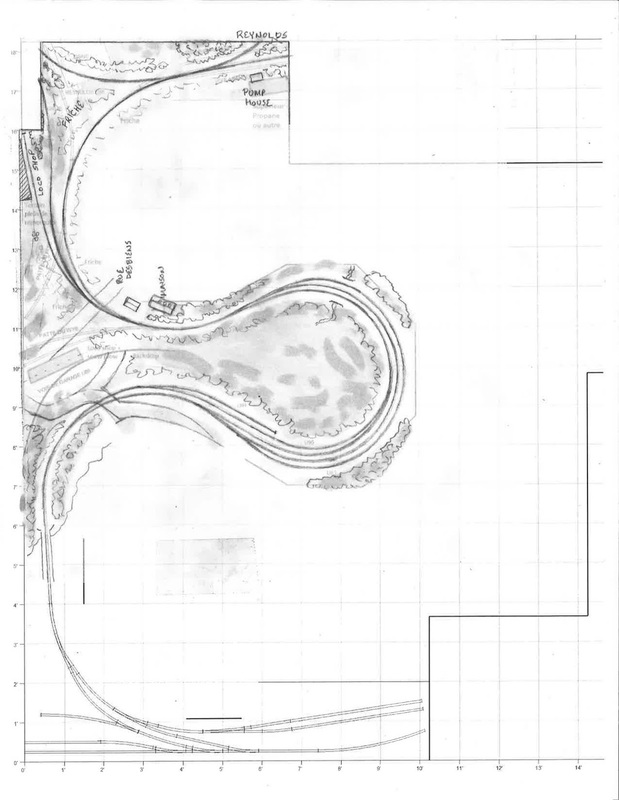 Each room of the layout represents a specific scene with specific tasks to perform: Villeneuve and Clermont. They can be operated independently and each location can take up to 60 to 90 minutes, sometimes more. I find this particularly interesting because depending on your mood, you can operate the place you want and it all makes sense. Unfortunately, as much as I find Villeneuve and Donohue to be coherent scenes, I can’t say the same about Montmorency and Clermont which are, truth to be told, a little bit cramped for our needs. Over the years, I came to the realization I prefer realistic yet focussed scenes rather than a collection of glimpses of the prototype. To each his own, but to me, I’d rather sacrifice a few scenes to be sure the ones I model have enough space to be immersive. In that regard, I’m a fan of long sidings that require slow movements over the scenery. Now, that brings us to the main topic: the CFC timetable. 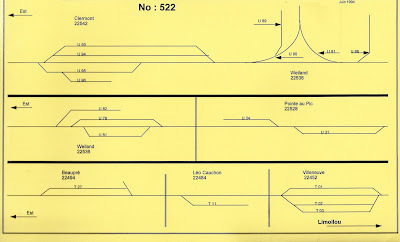 This interesting piece of railray history tells us about the track diagram, their function but also how the train was handled. While crude, you get a clear picture how a work day was on CFC circa 1994. And since many CFC employees were ex-CN ones working on Murray Bay subdivision, we know things weren’t that much different from the 1980s. The big difference was that CFC locomotives were stored and serviced in Clermont instead of Limoilou. According to the timetable, the large yard in Clermont was mainly used for and by Donohue to store extra cars and build up consists. I can also recall some cars, mainly from Reynolds (an aluminium cable factory) were stored there. As you know, when designing the area, we merged Wieland and Clermont yard together, making it far smaller than it was on the prototype. And we ended up having some storage issues… Once again, the prototype was right and we were wrong thinking these extra tracks were superfluous. In fact, the CFC timetable gives the role of each track and it makes a lot of sense... As things stand, we only modelled tracks U95 and U96, failing to understand tracks U93 and U94 were the most important ones in handling traffic. Also, the timetable gives more details about the Wieland area. I cross-referenced this data with pictures of the 1990s and a video from 2001. Things started, once again, to make more sense to me. From 1993 (at least) to 1996, a short siding numbered U82 and served by a muddy road was used to load lumber from trucks. 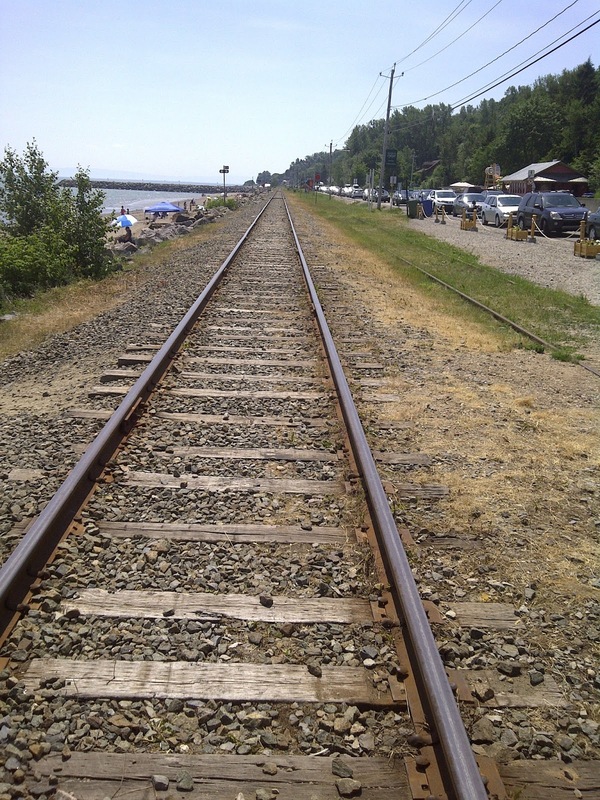 By 1996, the wye tail track lengthened significantly and used as a rail-route lumber transloading facility which was used up to the freight service demise. It is also interesting to note CFC bought a defunct customer warehouse in 1993 and converted it as an office and a shop (track U89) by adding a concrete pad. The three SW1200RS and the ex-CN snow plow used to be stored there. So now we are back to Jérôme’s question: can we turn Montmorency into Charlevoix without cramming too much tracks yet improving the experience in such a way Clermont will now works like the prototype? Well, the short answer is yes. I designed two scenarios taking in account the club is serious in setting firmly the layout in the early days of CFC when suitable motive power will be available. That said, we don’t plan altering Clermont until Villeneuve is done, so we have a lot of time ahead to think about it and test the ideas. All concepts are based on one idea: the actual scene we call Clermont becomes Clermont yard and Montmorency is converted as Wieland. Wieland is made of two distinct features: the wye and a small yard (a bunch of sidings really) a few hundred feets away. 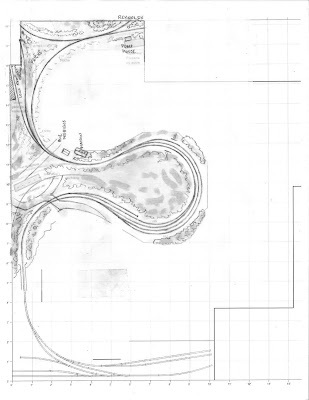 The first idea was to cram both part of Wieland on the layout. Not only the number of turnout exploded, but the scene quickly took a Walthers catolog look. Also, in less than 10 feet were 3 grade crossings! I quickly dismissed that idea. The next one focussed on the wye. The reason behind that is the fact the yard in Wieland lost all its rail-served customers by the mid-80s. It still had a purpose, but not one that couldn’t be handled by other tracks elsewhere. The wye area is of interest because transloading occurred there and a siding served another major customer (Reynolds). Add to that locomotives were stored there and you get almost everything you need. 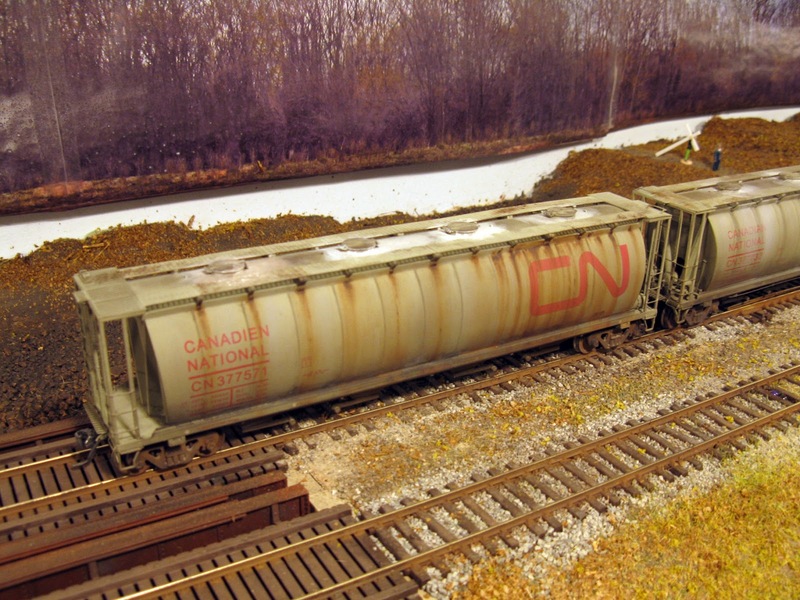 Having Reynolds and the transloading facility is not only a matter of “adding interest” but rather a way to ensure we can replicate realistically a CFC freight manifest with its string of bulkhead flatcars and a few gondolas. Handling all that traffic at Clermont team track was a little bit a stretch. The second concept is far more interesting than the first one. Less track, only the useful ones and more space between elements are key features. It better captures the backwood feel of the prototype. As for the loss of the river scene, it is indeed sad. I certainly love to shoot picture there, but this scene should be longer (encompassing Montmorency) to truly work. 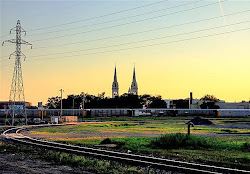 As it is, it’s only a vignette and we must admit it is impressive, but most of the time, railfans were much more accustomed to more mundane scenes like Clermont, Baie-Saint-Paul, Beaupré and Villeneuve. Also, having Clermont and Wieland together adds a layer to operation that could make handling trains less cramped than they are right now. I don’t see it as adding a new scene, but rather as expanding one. I can’t stop myself to think of this layout as two very large cameo scenes sharing common operations. Could it be that I no longer care about things such as mainline run? Maybe… and this is probably the after effect of designing too many small switching layouts. In the end, the layout could boil down to two rooms: one dedicated to cement operation in Villeneuve and one to Clermont for wood products. This is the essence of Murray Bay subdivision. In fact, it is Murray Bay subdivision in a nutshell. Will all this thinking spell the end of Montmorency? Maybe not and maybe the result could be very different from this hypothesis. Anyway, I find great satisfaction distillating a project down to its essence rather than trying to add icing, cherries and exotic ingredients to make it look – superficially – more palatable. 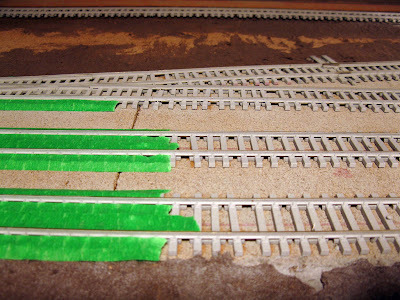 Another round of painting ties and ballasting in Villeneuve yesterday. While reassessing the tie color, I decided to add another coat of grayish-brown oil wash over the mainline ties to make them stand out a little bit more. I've found oil paints to be extremely forgiving for this task because you can build up the color in several layers and they are extremely good into adding texture and color variation to the ties. The long drying time is also welcome since you can touch up your work as required during the session. 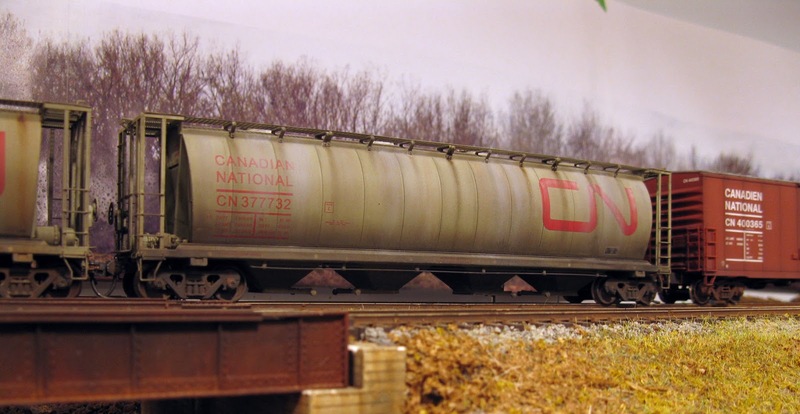 They blend seamlessly together, bringing up a level of realism you could only surpass using real wood ties (which I reserve for the Connors layout in the future). But in fact, oil paints induce something we rarely care about: they force you to wait between coatings so you can take your time moving toward your goal instead of slapping paint mindlessly in a short time. The extra waiting days give you the opportunity to revisit what you've done, reassess the results and take any steps required to bring more life into your model. I also started to ballast the mainline and yet again decided to learn from my past mistakes. I generally follow Mike Confalone's techniques of using sifted limestone and added spots of sand and dirt. While it gave decent results, it wasn't an homogeneous blend and the ballast was quite dusty making the ties looking milky. 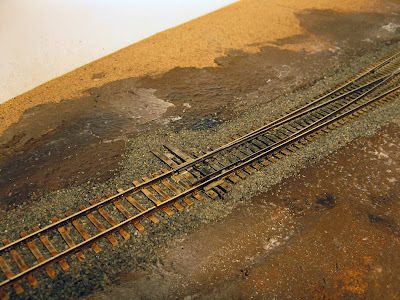 I certainly don't use the same mineral as Mike and ballasting is a very personal approach. To each his own. My variation on his technique was quite good for neglected spur and sidings, but certainly not suitable on mainline track. It was time to look at the prototype with fresh eyes and try something else. I took my three ingredients and sifted them down the wanted size in separate containers. Then, using a very fine sift, I removed the dust and only kept the gravel. The blend was then mixed according to prototype pictures to get the gray-beige peppered look that was usual on Murray Bay subdivision back then in the late 1980s and 1990s. The new blend gives quite good results and the it no longer looks patchy. 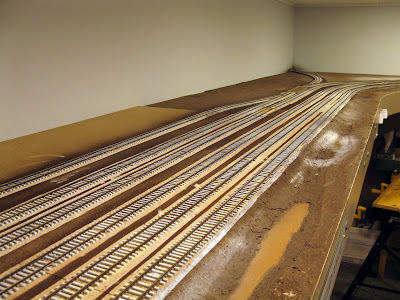 The stretch of track west of Sous-bois Avenue is done but I blended enough ballast to do the entire mainline up to d'Estimauville Avenue next time. Meanwhile, Jérôme and I took a step back to asset the layout. We believe Villeneuve should be completed within 18 months if we keep our pace. But this is not a schedule but just a general idea of where we are going. Building a layout isn't a race and it will take the time it needs. Slowly but surely I am cleaning up the Photobucket mess on the blog. It’s certainly not a joyful task to perform, but it can be soothed by listening to some good old music. So far, all blog posts have been restored from 2017 to March 2015. I guess I’m about half through this. I can’t make any promise about a completion date due to my extremely busy schedule, however I hope it will be completely done by the end of the year. I also came to realize a few things while updating the blog. First, I use far too much pictures to convey the subject. Step by step images are great, but in many case, less pictures of better quality would have been better. I’ll try to improve on that in the future. I also discovered linking pictures from external sources for the sake of fairness toward my sources doesn’t work in the long term. Many pictures are now lost and can’t be replaced. From now on, I’ll use a local copy of external sources directly on the blog and link the original material for reference. It will be easier to handle that way. I know this is quite a gray zone in terms of copyright, however, be always assured I try my best to acknowledge sources as best as I can. If you own material, feel free to contact me if you want to take it down. Also, I’m getting tired of the generic blog template appearance. I never did anything to improve it and feel it is no longer on par with the work I present on it. As many readers have seen over the last year, I already improved drastically the appearance of my other blogs, including Harlem Station and Temiscouata. On the other hand, I have no strong inspiration at the moment that could convey the personality of this project thus I won’t make any move until I get a good concept. In the past, I often said the layout name (Hedley Junction) didn’t fit anymore the actual project, however, it is now well-established and I don’t feel like changing it. To some extent, this name convey a sense of connection with a wider world, which is coherent with the Murray Bay subdivision. Fellow Canadian modeller Chris van der Heide recently sent me a YouTube link to a video filmed back in 2001 when Chemin de fer Charlevoix was still powered by SW1200RS. The video was shot and kindly uploaded by a gentleman called Jack D. Kuiphoff. 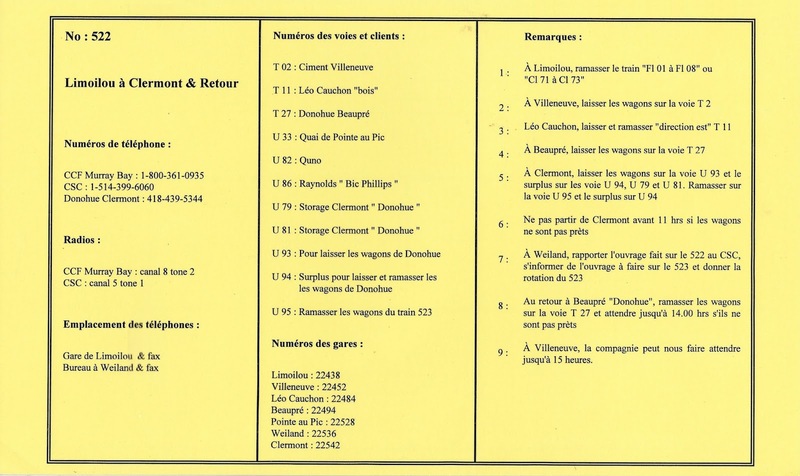 It documents what used to be daily normal operation in Wieland (Clermont) where CFQ had a small transloading yard for lumber products. The yard still exist but is no longer used for freight operation. 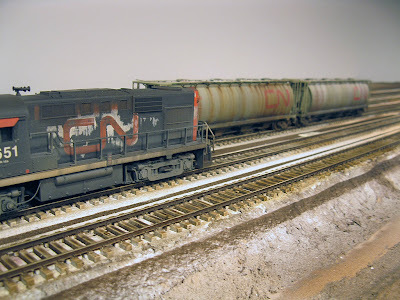 On our layout, this particular spot is roughly matched by the grade crossing and feedmill scene in Clermont. This is far to be a prototypical rendition, but at least it gives us some an opportunity to handle lumber products. 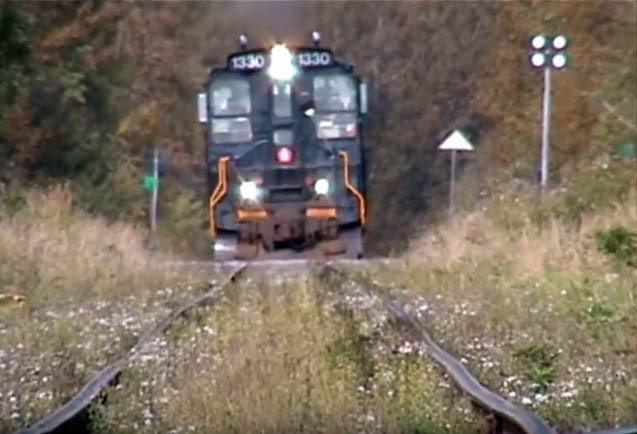 Another interesting aspect of this video is the sound which gives another level of information to help replicate what use to be railroading in Charlevoix. It is certainly another good reason to replicate these fine locomotives. Also of interest is the vegetation, track and roads. A few years later, rehabilitation work took place and it had an impact of the aspect of these elements. It's good to see them as I used to know them when I was still a teen. As I stated earlier this year, I wanted to step up my game in terms of painting tracks in Villeneuve. After many years of hitting the rails with a good old can of Krylon Camouflage Brown, few randoms washes of cheap acrylic paint, a dab of weathering powder and calling it a day, it was time to be more serious. Let's face it, it doesn't look right to me. 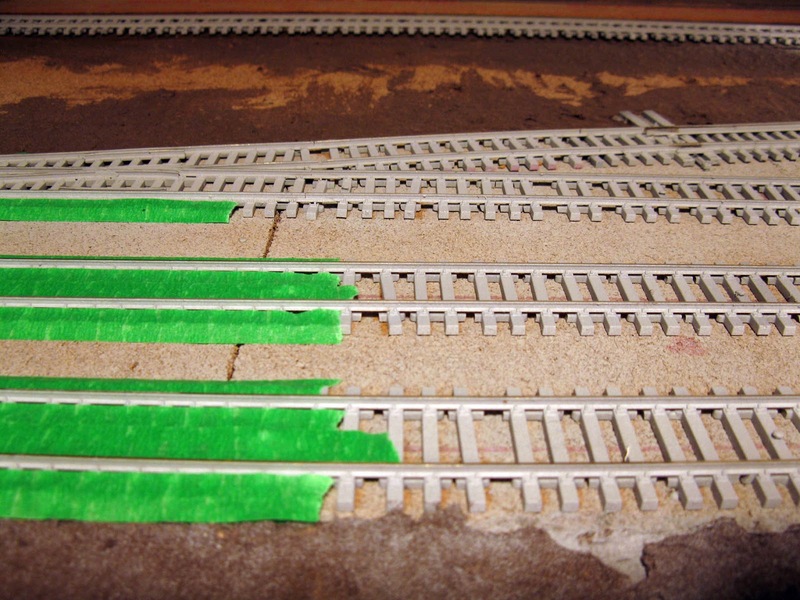 Many trusted modellers got great results with this trick over quality flextrack, but I found out over time their prototype generally implied relatively well maintained mainline track. Such wasn't the case over the CN Murray Bay sub. As a kid, we used to walk the track for a few feet and I certainly recall the ties weren't that dark but rather silvery and lightly brownish from weathered away creosote. 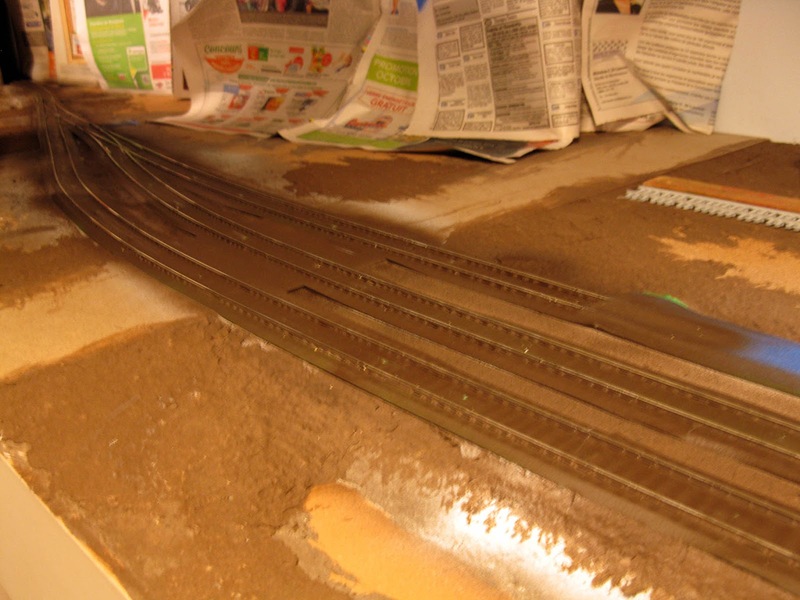 To get that look, one must thing about track the same way car weathering is done: in layers. Since I'm using recent PECO North American style tracks I know they have enough crisp details to be correctly weathered without looking out of place. That said, I have also another limitation due to our club meeting structure. Once per week, often less, we gather together one evening. It means time is limited and we must go right to the point quickly if we want a decent amount of progress. 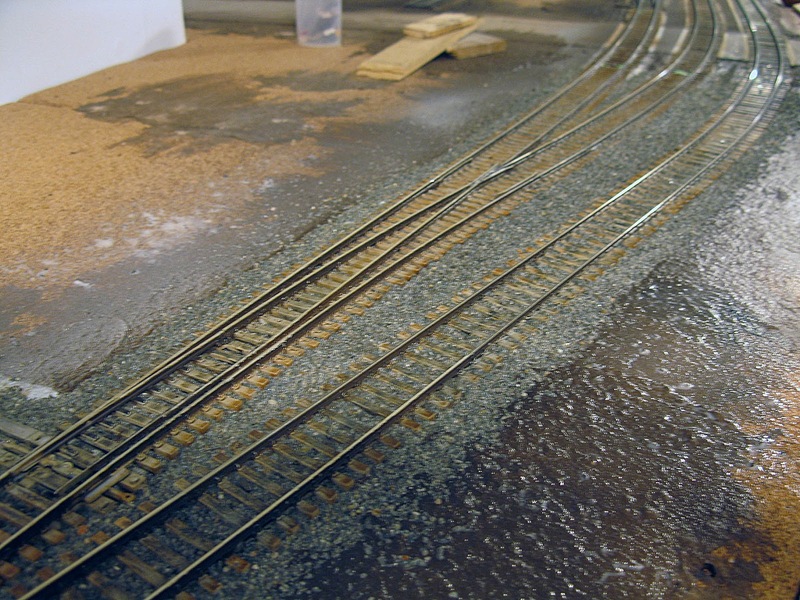 Also, since painting tracks involves a fairly large amount of spray painting, we thought it would be best to do that on the same day to minimize exposition to harmful fume (even if wearing approved respirators). Here is the procedure, which can be adapted to suit your need and prototype as you see fit. While the foundation color steps remain true, the finer weathering job should reflect the effect you want to achieve. Remember, these are guidelines, not a creed to be followed. I certainly recommend readers to take a look at Mike Cougill's articles about track weathering on OST Publications. While Mike goes further than most would do, I suspect some people could discover an area of interest they never expected to be so interesting. First, the track is entirely painted with white primer (or flat white) which will be our foundation color for weathering. Second, when the primer is dry, mask the ties with tape. Third, paint the rails with Krylon camouflage brown (or a similar color). This will be the rusted steel foundation color. 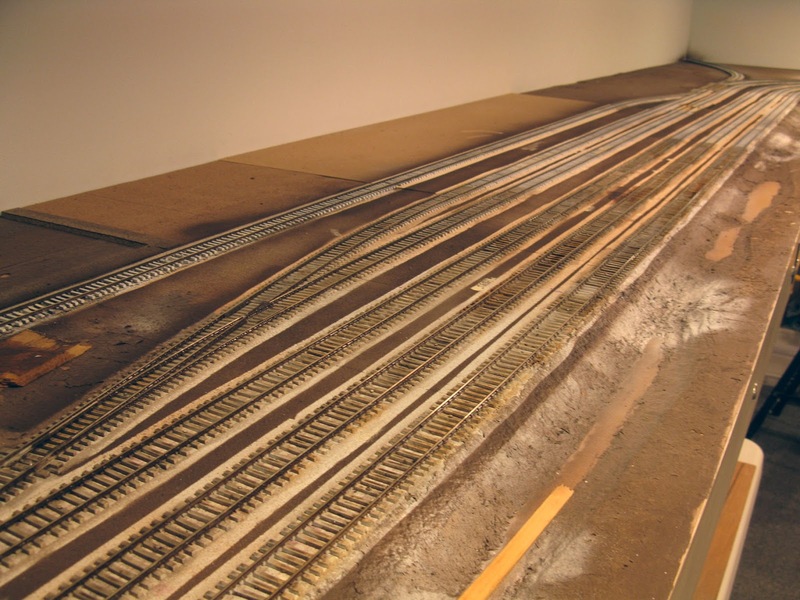 Fourth, remove masking tape on all the trackwork and touch up any white primer that could have lifted during the process. Use any acrylic or oil based paint you like and apply with a small brush. Fifth, prepare an oil wash made of oil paint and odourless turpentine. Recommended color is Burnt Umber which can be mixed with some black to get a grayish color according to your prototype. Before applying this oil wash, make sure the spray paint is dry. Sixth, add more wash where needed to get the right look according to prototype pictures. Some track work such as turnouts are generally darker in some area due to grease and oil spills. Seventh, using full strength oil paint you can add small details like creosote seeping or drybrush some features. It is the time to darken some ties to make them like new replacement ones. Eight, ballast the track with suitable material. Ninth, using Dark Earth weathering powder, weather the rails and steel component to give them a realistic rusted powdery look. If you use details such as fishplates, it's a good time to hit them with lighter weathering powder so they pop up a little bit. 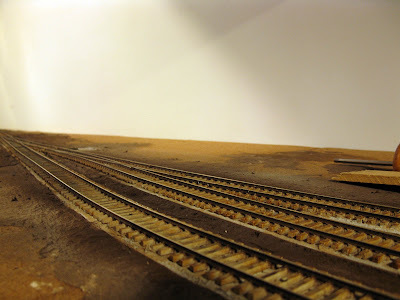 Tenth, using washes and/or PanPastel and/or weathering powder, add any oil dripping, spillage, dust and weathering required on the track center and ballast. This vary from prototype to prototype and era depending on locomotive used, fuel and other factors. 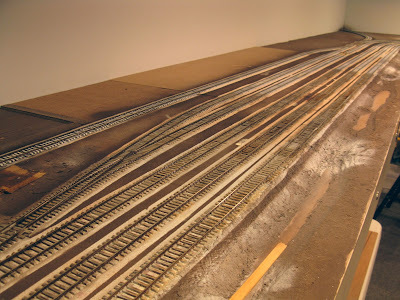 And now for a time accessment, it took us about 8 hours of work at a leasure pace to paint about 18 feet long of mainline, including a 5 tracks yard with associated turnouts. This represents about a quarter of the entire layout and I expect another 5 hours to completely weather the track. Given it will take about two work sessions, I consider this is quite a good investment in time. 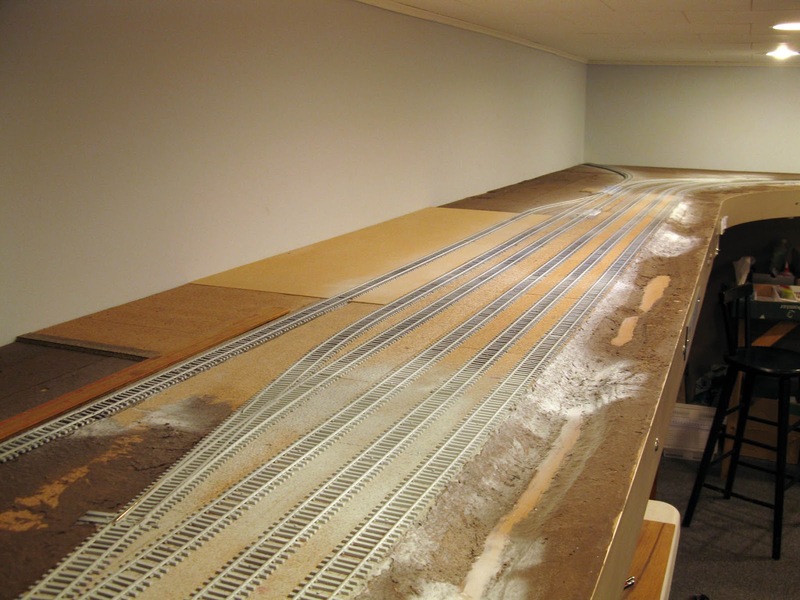 Particularly in a layout area where one can operate for a hour at slow speed and having the time to appreciate a higher quality track work. When Rapido announced their new "correct" cylindrical hoppers for bulk commodities like cement, I knew a few of my Intermountain cement cars would be phased out in a distant future. With that in mind, I thought it was an excellent occasion to weather them and get some experience before messing up with the Rapido fleet. Interestingly, cylindrical hoppers develop great weathering patterns over a relatively short amoutn of time, particularly cement cars. 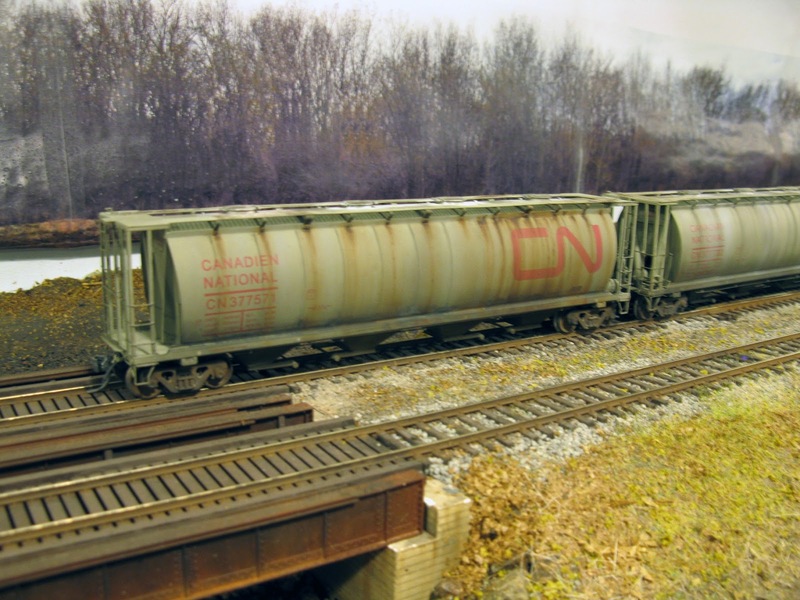 Cement is highly corrosive and take a toll on a railcar fleet in no time. Thus, armed with prototype pictures, I was ready to try my hand. I certainly didn't reinvent the wheel, only using my habitual weathering techniques (oil, powder, washes, India ink, etc.) to get the look right. As always, a good weathering job should always be about layering several coats of dirty to replicate correctly the natural process. If you want to rush things or treat weathering as a single coat of dirt you will fail to capture the real thing. Meanwhile, I've also started to work on a bunch of Procor cement car, which are even more interesting to weather. They are certainly not straightforward to do and I had to way a month for oil paint to dry, but patience is the only way to get good results. More on them on a later post.